Did you know that eating something salty can curb a sweet tooth? I swear it works. 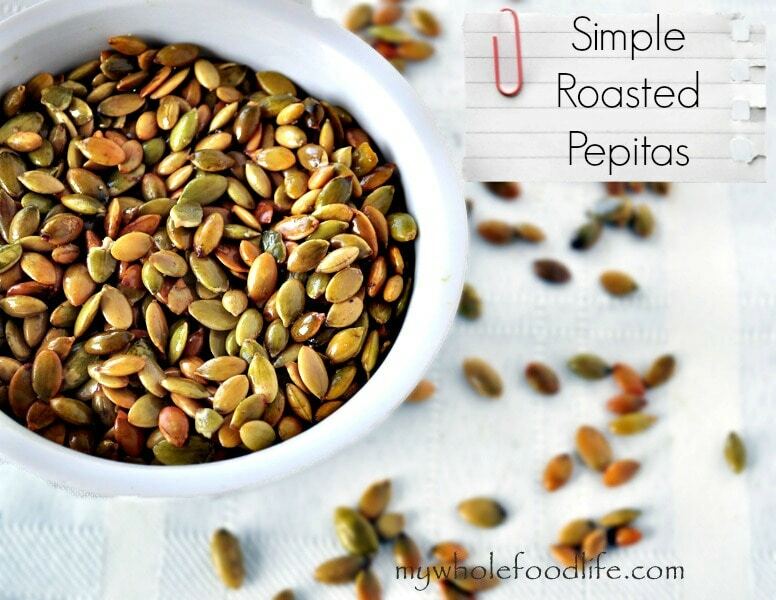 I keep roasted pepitas on hand all the time for that very reason. If you don’t know what pepitas are, they are the inside part of a pumpkin seed. Roasted pepitas have such great flavor. Pepitas are also a great source of magnesium and omega 3 fatty acid. When made in this fashion, they can be quite addicting. My kids love them as well. Roasted pepitas are also a great snack option for those that have nut allergies. Kind of like my Maple Cinnamon Roasted Chickpeas and my Nut Free Snack Bars. A healthy option when you need a snack! In a bowl , mix the pepitas and oil. Stir well until the oil has coated all the pepitas. Once the pepitas are coated, stir in the salt. Spread the pepitas onto a lined baking sheet . Bake for about 10-15 minutes, shaking them pepitas about half way through. Store in a glass jar on the counter top or in the pantry. They should last a week or two. Maybe more? They never last long here! I have some of these just sitting in my pantry waiting for this recipe :) Do you think it would work with coconut oil or would olive oil be better? They will have a coconut taste to them, but you can do that. It should work with coconut oil as well. I just like the taste of olive oil with the pepitas, but I have done it both ways. I have a question, you linked the pumpkin seed kernels that I assume you use and after reading the amazon reviews for them there are many concerns about those seeds, what do you think of them? Did your packages come in a clear bag with no markings, etc.?? I usually buy Bob's Red Mill. I guess I linked the wrong one by accident. Thanks for telling me. It's been corrected. Actually pepitas are not hulled pumpkin seeds. They are hulless pumpkin seeds from various varieties. For example the Kakai pumpkins. The pepitas are hulless. If you have ever tried to hull a pumpkin seed it is impossible. We grow Kakais are our farm. I'm sorry that happened. :( Do you think your oven temp may be off?